My daughter got her ACT score today. She’s planning to go to Indiana University (she’s only applying to one school). Today’s ACT score, combined with her GPA and her class rank, automatically qualify her for an Indiana Excellence Scholarship and admission into the Hutton Honors College. Way to go, sweetheart; you rock! We finally got our power back Friday evening. 126 hours is a long time to go without electricity; when it came back on we were so excited that we were going around turning on lights just because we could. Sad, I know, but such is the modern world we live in. Now we (and by “we,” I mean mostly Doug, but also me and the kids to some extent) are in cleanup mode. We got the huge branches out of our driveway the first day, but removing the partial trees and endless branches from my mom’s yard is taking longer. (A tree company did remove the tree from her roof, fortunately, and Doug used a rope tied to the back of our Jeep to pull down the huge, deadly treetop that was dangling precariously over the front yard.) One part of this cleanup process has been fun: I get to use our Alligator Lopper. 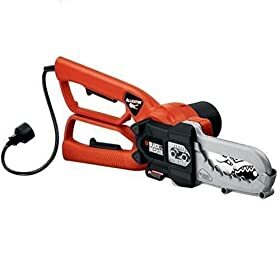 It’s like a mini chainsaw with enough safety features that I’m not scared of it; you open it’s alligator-like mouth, hold both handles, press the switches, and basically bite the branch in half. It will handle anything up to logs 5 or 6 inches across. Fast, efficient, quiet (it’s electric), and … fun. Mosquito 86 system: death to mosquitoes! But then there’s the not-fun part of being outside in southern Indiana at this time of year: all the biting insects. Mosquitoes and who-knows-what-all lurk in our grass, bushes, and trees, and the moment we set foot outside they begin chowing down on us. During this cleanup process we’re going through a lot of anti-itch ointment, not to mention that we don’t dare sit outside in the evening. 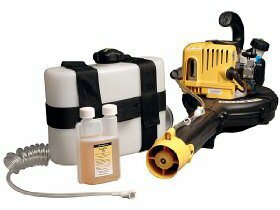 But today I read about another incredibly cool-sounding power tool, which has a suitably imposing name: the Mosquito 86 Mosquito Prevention System. (If you follow the link, you can even try to win one.) It isn’t a fogger; it uses a blower to spray a pet-and-people-safe but mosquito-and-tick-deadly agent that lasts up to 3 weeks. I would so love to have one of these, just to be able to experience life in our yard without insect bites. There are power trucks parked on our street. Guys with chainsaws in our woods. A sense of hope in the house. We are far from alone. As of this morning, 20,000+ Indiana residents and 100,000+ Kentucky residents in the Louisville area remain without electricity. (In addition, more than 100,000 remain without power near Cincinnati along with 200,000+ around Columbus, OH.) Some of these people may be waiting as long as another week for power; the utility companies continue to find new nests of downed lines and broken poles, all of which add to the time required for repairs. Hundreds of people lined up for food assistance in Louisville yesterday. The city governments have set up shelters; the Red Cross and other charities are providing meals. But this ordeal is proving intensely difficult for those who live on limited incomes and have had to throw away all their food, and those with medical conditions that require oxygen or other electric-powered equipment. As it happens, Louisville is hosting the Ryder Cup (a golf tournament that is important enough to merit its own entire section in the newspaper each day), and many people — including me — resent the attention and money being poured into a sporting event while tens of thousands of citizens are suffering. And somehow, despite the fact that this is the most widespread damage any of the local utilities have dealt with in their history; despite all the people without electricity and, in many cases, water and/or phone; despite the depth of the ordeal that has hit our citizens and businesses; we’ve remained largely absent from the national news. A friend who lives on the west coast had no idea any of this had happened. Everyone knows that Hurricane Ike hit Texas, but no one outside the Midwest seems to know that the hurricane also hit Indiana, Kentucky, Illinois, and Ohio. It has been and continues to be a monumentally strange ride. Our generator is almost but not quite exactly like this one. Nah, I thought, too good to be true. But when I called, they said yes, they had lots of generators for sale right at the front of the store. A little while later I headed down to check them out. They had received a shipment of about 200 this morning, and thanks to the sign and radio announcements, they had about 30 left by 3:00 p.m. As I stood talking to the clerk, people bought another 5. Doug made a couple of phone calls and learned that they hadn’t jacked up the price. A little while later, after some discussion, we became the proud owners of a 5,000-watt generator. It’s running now, safely tucked away behind the house, well out of range of windows and doors. We have hot water. A cold refrigerator. A working computer (and working internet — I’m still not sure how the cable is functioning, but who am I to argue?). A working lamp. We’ve been made incredibly happy by these comparatively small things. Thanks, Home Depot, for making my week. This entry is brought to you courtesy of my friend Mark and the other fine folks at his company, Stratis Technologies. If you or anyone you know has anything to do with banking, check them out; they’re awesome. Still no electricity at my house. A survey conducted this morning indicated that 100% of women writing this blog vastly prefer washing their hair in warm water, rather than cold. As I was driving here to my temporary office, two local DJs were discussing the post-midwest-hurricane situation. One got his power back this morning; the other still has no electricity. The lucky one commented in a joking way that it’s all about your attitude. “Hey,” the other one responded, “I have an attitude — it’s just bad, that’s all.” She also suggested that he could bite her attitude. Now there’s a sentiment I can relate to. My husband and daughter are sunny, optimistic people who can weather any storm (in this case, literally) and maintain a positive outlook. I, on the other hand, have trouble seeing a clearly half-empty glass as half full; and despite full awareness that I’m lucky to have running water, an intact house, and a healthy family, I want electricity and I want it RIGHT NOW. But that isn’t going to happen. Our electric company is saying that they’ll have the remaining power-less 25,000+ Indiana customers back on the grid by midnight Saturday, and I think we’ll be near the end of the line. I spoke to a technician yesterday when he walked through our yard, inspecting lines, and he said that although our immediate problem is a downed wires in the woods behind our house, those wires connect to other wires that are also down, which connect to other wires that are also down — and all those lines aren’t just down, they’re tangled in trees and branches and will have to be sorted out and repaired by guys on foot because trucks can’t reach many of the locations. This is part of the price we pay for loving trees and living among them. As soon as this event has left the collective memory, and generators are once again to be found at the local Home Depot, we’re buying one. Yes, I know that nothing like this incredible wind damage has happened here before, and it’s unlikely to happen again. But I also know for sure that this is the last time my family will go for days without a refrigerator and hot water. Once has been more than enough. I’m writing this in the upstairs home office of extremely generous friends who live about 30 minutes from us on the other side of Louisville (thanks, Rick and Holly!). I’ve set up my PC on a card table and am hooked into their cable; my kids are playing their Wii and using a laptop. I’m getting ready to check my email and do some work. Why are we here? Because on Sunday, the 80 mph remains of Hurricane Ike came to the midwest and knocked the hell out of southern Indiana and the Louisville area. Our power went out Sunday morning as trees began to fall. My mom has a tree through her roof. If we’d been home when the worst winds hit, both of our cars would have been totalled by the immense tree limbs that landed in our driveway. As of this morning, power is still out for nearly 50,000 people in our area of Indiana and more than 200,000 in Louisville. All the schools are closed and may be closed the rest of the week. Every neighborhood is full of downed trees and littered with leaves and branches; power lines dangle from snapped poles. Yesterday my husband and I went for a walk and saw an enormous tree lying across a road less than a mile from our house; it took down about 200 feet of lines. In a nearby neighborhood another huge tree was snapped and leaning on its neighbor; more power lines were coiled on the grass. This is the reality all around us. Before we came to visit our friends in their electrified sanctuary, we cleaned out our refrigerator and freezers. Conservatively, $500 or so of food hit the trash: the most depressing part of this yet from my standpoint. We’re now eating out for every meal. Assuming it’s another couple of days before the power comes back, this little adventure is going to get very expensive. Not to mention that I’ll need to find places with plugs and wifi where I can try to get some work done. For some reason the national news is ignoring our part of the world in their reports on Ike and its aftermath. But friends who’ve talked to folks in Texas and other areas report that we were hit harder than areas more directly in the original hurricane’s path. It’s like nothing we’ve ever seen or dreamed could happen. It’s a crazy nightmare situation. I’m trying to be relieved that we didn’t lose our phone or water, and that our house wasn’t damaged; but optimism is tough right now.